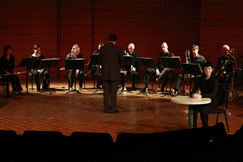 Edge of the Center: Ensemble Linea at June in Buffalo 2013! Ensemble Linea at June in Buffalo 2013! We’re looking forward to having Ensemble Linea for June in Buffalo 2013 – they were a big hit here in 2011 and we’re happy to have them back for round 2. Adding to the French constituency will be composer Raphaël Cendo, who will be accompanying them from France as part of this year’s JiB Composition Faculty. While they’re here they’ll be interpreting works from June in Buffalo composition students, as well as JiB 2013 Faculty Composer Brian Ferneyhough’s flute piece Mnémosyne, and a fresh concert of contemporary music pieces from France. 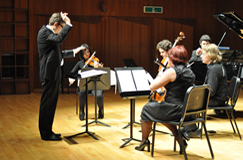 “Founded in Strasbourg by pianist and conductor Jean-Philippe Wurtz in 1998, Ensemble Linea has, since its beginnings, been committed to promoting a democratization of contemporary music, giving priority to the encounter with the audience, to openness towards other artistic disciplines, and to an active booking strategy. Coincidentally, another connection currently exists between Ensemble Linea and the University at Buffalo Music Department, as Daniel Bassin, the current conductor and music director of the University at Buffalo Symphony Orchestra, is now studying at the Abbaye de Royaumont Conductor Master Class, where he is rehearsing with Ensemble Linea the works of Iannis Xenakis, György Ligeti, Hanna Eimermacher, and others, under the tutelage of Péter Eötvös. Link to this post here. June in Buffalo 2013 composers announced!